Southwest Florida might be one of the last places you would think to look if searching for talented hockey players was the objective. The Fountain of Youth, maybe. But hockey players, not so much. Hockey, hockey, hockey, hockey all the time. For a young Jeff Heuerman, though, the decision was easy. Hockey was the sport he loved, so he was going to participate – even if it was 80 degrees on New Year’s Day and a pond in Naples, Fla., had never frozen over. Heuerman is joined by Joey O’Connor and Doran Grant as current Buckeyes who played hockey as youngsters. As an accomplished junior player, Heuerman was offered the opportunity of a lifetime: a spot on the nationally acclaimed Detroit Compuware team. He accepted. The team was founded by Carolina Hurricanes owner and Compuware executive chairman Peter Karmanos Jr. It’s produced such stars as Eric Lindros and current Columbus Blue Jacket Jack Johnson. Heuerman’s roommate on the team, Austin Watson, was drafted 18th overall by the Nashville Predators in the 2010 NHL Draft. Heuerman was a center and forward before moving to right wing for Compuware. A career in professional hockey may have been on the horizon had Heuerman stuck with the sport. Hoisting Stanley Cups for the Detroit Red Wings, rather than crystal footballs for the Ohio State Buckeyes, was Heuerman’s dream. Instead of emulating Archie Griffin, Cris Carter and Andy Katzenmoyer, he was skating in ice rinks with visions of Brendan Shanahan, Steve Yzerman and Mike Modano. He eventually developed into one of the most coveted tight ends in the nation for the 2011 recruiting class. An all-state, all-area and all-district selection as a senior, Heuerman had a pick of the litter for his college destination, ultimately signing with Ohio State and then-head coach Jim Tressel. Heuerman had one catch last season, coming in the Gator Bowl against his home-state Florida Gators. He has two catches for 18 yards in 2012. One of his receptions came this past weekend against California in Ohio State’s 35-28 win. Heuerman was one of four Buckeyes to grade out a champion on offense. His athletic skillset makes him a desirable target for quarterback Braxton Miller, but Heuerman is also a superb blocker. Peterson played and coached at OSU. Coaching big-time college football is a pretty good gig if you can get it. Handsome salary, good benefits, perks out the wazoo, use of a private jet for recruiting. It’s more Trump than Theresa. But it’s not all glamour. There are the long hours at the office, days on the road, time spent away from family and, worst of all, the responsibility of telling people they no longer have a job. When new coaching staffs come in, many of the old pieces are not brought onboard. Instead, they are forced to uproot families and venture out on the long and winding road of collegiate coaching. 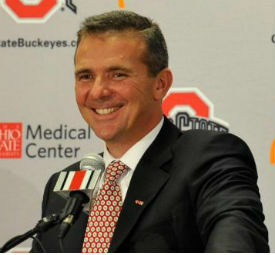 That situation arose last November when Meyer was hired by Ohio State. Stan Drayton (coached alongside Meyer at Florida), Luke Fickell and Mike Vrabel were the only coaches kept on staff. One of those former staff members will be back in Ohio Stadium on Saturday coaching against the Buckeyes. Former tight ends coach and recruiting coordinator John Peterson is now the offensive line coach for Alabama-Birmingham. “That's better than a good guy, that's a great guy,” Meyer said. “I was here (as a graduate assistant) when John was playing, so I know John. He's a great coach, great guy. Heuerman can attest to that firsthand – Peterson recruited him to Ohio State and coached him during his freshman season. Peterson, a native of Middletown, Ohio, played on the offensive line at Ohio State from 1987-90 and was a graduate assistant under John Cooper in 1993 and ’94 prior to his eight-year stint under Tressel. Fickell was a part of those staffs. It’s something Fickell has already experienced. Following a playing career at Ohio State that included a school-record 50 consecutive starts, including the 1997 Rose Bowl with a torn pectoral muscle, Fickell went on to the NFL. But a torn ACL in his rookie season with the New Orleans Saints ended Fickell’s hopes of continuing his playing career. So he came to the place he spent the rest of his life: Columbus, Ohio. Fickell was hired as a graduate assistant and spent the 1999 season on Cooper’s staff. Then, in 2000, Fickell was hired at Akron to be the Zips’ defensive line coach. In 2001, he stepped foot in Ohio Stadium as a member of the opposing team, when Akron played Ohio State in Jim Tressel’s debut. One season later, Tressel hired Fickell and he’s been at Ohio State ever since. A laugh is never far from Meyer. Much has been written and spoken about John Simon’s stirring postgame speech following Ohio State’s win over Cal. On Monday, Meyer talked to his Incredible Hulk of a defender about that shoulder injury. Moments later Meyer was asked about the status of fellow defensive lineman Michael Bennett, who has not played this season due to a groin injury. The room then exploded into laughter, Meyer included. After a brief delay, he continued his remarks. An update on Bennett should be available after Wednesday’s practice, but whether he plays or not likely won’t be decided until warmups on Saturday. McGee is 1-4 vs. OSU and 0-2 vs. Meyer. The UAB Blazers face their second straight ranked opponent this week when they travel to Columbus. UAB lost, 49-6, last Saturday at then-No. 8 South Carolina. The Blazers are 0-2 and are heavy underdogs in their first meeting with No. 16 Ohio State. Despite the Buckeyes' 3-0 mark, Meyer isn’t taking anything for granted. 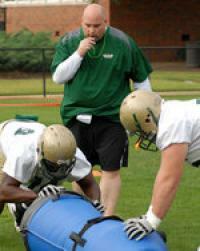 UAB is also in the midst of a season with a new head coach. 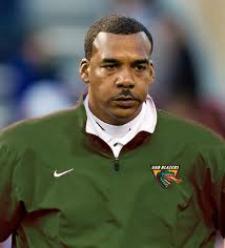 Garrick McGee went to Birmingham after leading high-powered offenses at Northwestern and Arkansas as an assistant. He helped orchestrate a win over Ohio State, in 2004, his first season at Northwestern. It was the Wildcats' first win over the Buckeyes in 33 years. But it’s been downhill since for McGee, who sports a 1-4 record against Ohio State and a 0-2 mark in the Horseshoe. The Buckeyes outscored Northwestern 160-24 the next three years and then beat Arkansas 31-26 in the dramatic 2011 Sugar Bowl. McGee was 0-2 against Meyer’s Florida Gators, losing to two Tim Tebow-led teams.